Help staff quickly locate and use administrative agency information, rules and regulations. This course and any combination of its topics are currently available as custom on-site training for your organization. We have tailored this course for engineers, scientists, and many people new to Washington. For more information about how this training can help your members and staff, please contact our client liaison. 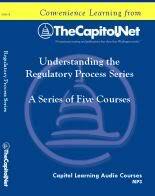 Also see our Understanding the Regulatory Process course.